The Magic of Oz by L. Frank Baum - "Royal Historian of Oz." A Faithful Record of the Remarkable Adventures of Dorothy and Trot and the Wizard of Oz, together with the Cowardly Lion, the Hungry Tiger and Cap'n Bill, in their successful search for a Magical and Beautiful Birthday Present for Princess Ozma of Oz. 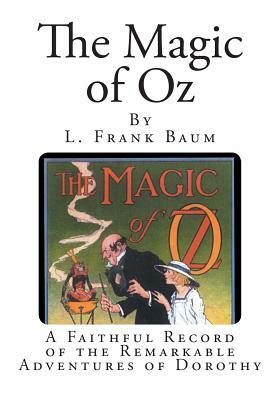 The Magic of Oz: A Faithful Record of the Remarkable Adventures of Dorothy and Trot and the Wizard of Oz, Together with the Cowardly Lion, the Hungry Tiger and Cap'n Bill, in Their Successful Search for a Magical and Beautiful Birthday Present for Princess Ozma of Oz is the thirteenth Land of Oz book written by L. Frank Baum. Published on June 7, 1919, one month after the author's death, The Magic of Oz relates the unsuccessful attempt of the Munchkin boy Kiki Aru and former Nome King Ruggedo to conquer Oz. The novel was dedicated to "the Children of our Soldiers, the Americans and their Allies, with unmeasured Pride and Affection." At the top of Mount Munch, lives a group of people known as the Hyups. One of their numbers, a Munchkin named Bini Aru, discovered a method of transforming people and objects by merely saying the word "Pyrzqxgl." After Princess Ozma decreed that no one could practice magic in Oz except for Glinda the Good Witch and the Wizard of Oz, Bini wrote down the directions for pronouncing "Pyrzqxgl" and hid them in his magical laboratory.